On Monday, December 8, we celebrated the Feast Day of the Immaculate Conception. This is a busy feast day week and next up is December 9, feast day of Saint Juan Diego! 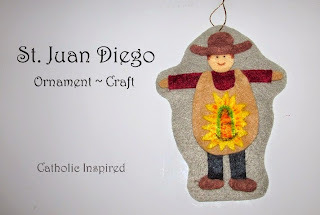 First, I just need to show you this super cute and beautiful felt ornament that Jennifer at Catholic Inspired made of Saint Juan Diego! Isn't she so talented? Jennifer has made several ornaments of the Saints and they are all so full of detail and beauty! 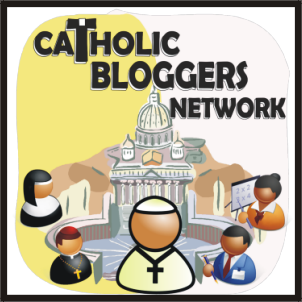 We enjoy watching the CCC of America video, Juan Diego-Messenger of Guadalupe. See below for a summary from CCC of America about this video and Juan Diego's true story. In 1531 Juan Diego found himself between two worlds…that of the Spanish conquerors and that of his own Aztec heritage. Because of his love for his people and his strong faith, Juan Diego turned to Jesus and His Mother, Mary for help in uniting his people. The answer to Juan Diego’s prayers has become one of the greatest events in the history of the Americas. 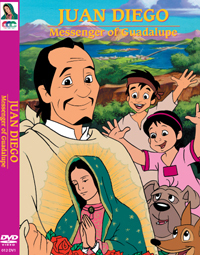 JUAN DIEGO, MESSENGER OF GUADALUPE is the true story of how the Blessed Mother chose a hero for a key role in a beautiful miracle that would united diverse peoples and change the course of history. In the Basilica of Our Lady of Guadalupe in Mexico City the miracle of the tilma of Juan Diego may still be seen, just as it was seen by the bishop in 1531. 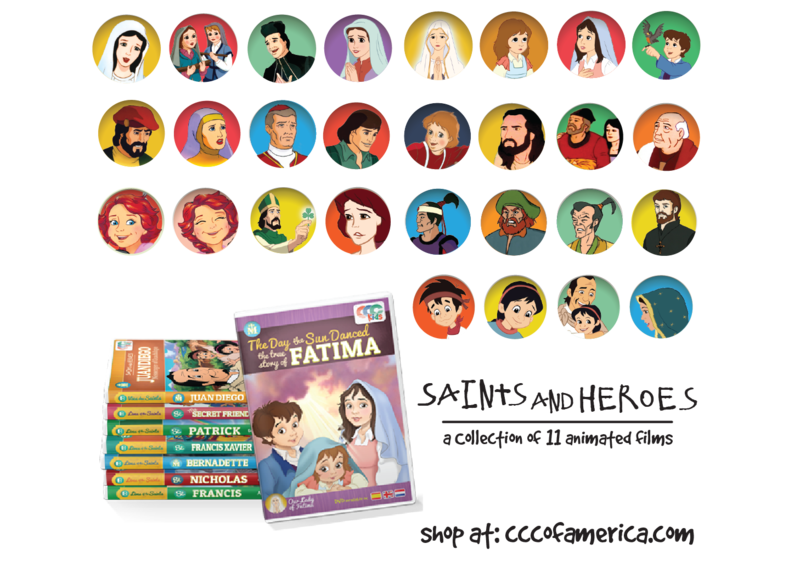 Holy Heroes sells a great CD with the story of Saint Juan Diego, which is currently FREE with the only cost for shipping! The CD also has the story of Blessed Imelda so you get 2 stories of 2 great saints on one CD! My children have listened to this Holy Heroes CD and others on car trips again and again! They are very well done and keep everyone's attention, children and adults! Then on December 12 we celebrate the feast day of Our Lady of Guadalupe, which ties in well with St. Juan Diego's feast day in the same week. 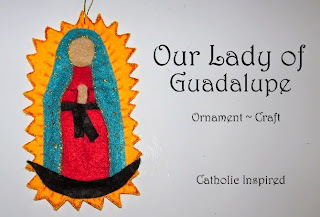 Jennifer at Catholic Inspired was busy again making this felt ornament of Our Lady of Guadalupe! 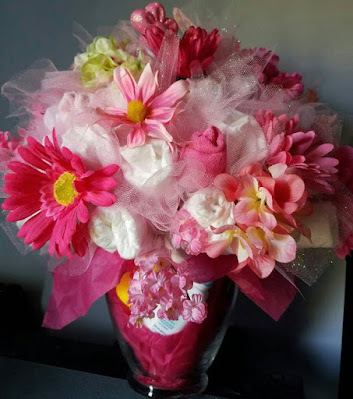 I just love the colors and detail! 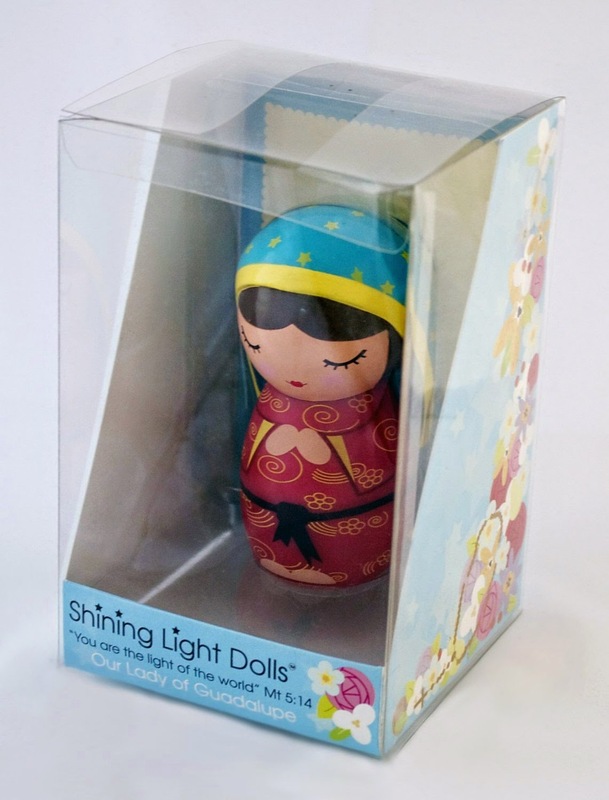 My 16 month old loves the new Our Lady of Guadalupe Shining Light Doll she got for Saint Nicholas Day! It is something she can hold that won't break and the little story book that tells the story of Our Lady of Guadalupe is great information! 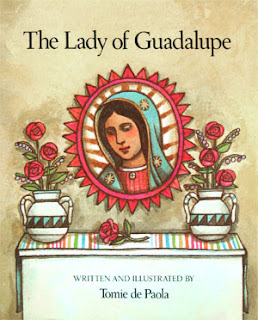 But, I just found this title, Our Lady of Guadalupe, that looks like a beautiful book about St. Juan Diego and Our Lady's visit to him. So I'll be putting this book on my wish list! 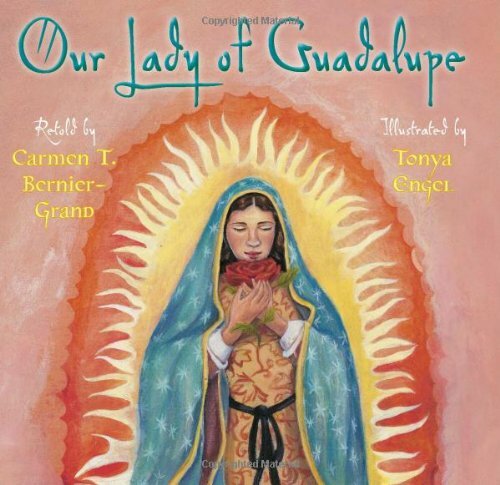 To celebrate the feast day of Our Lady of Guadalupe, we have done several things through the years. One year we went to a Mexican restaurant and lit an Our Lady of Guadalupe candle at the table. Or if we don't make it out to a Mexican restaurant, we light the candle at home and eat tacos. Some years (2010, 2013) we have visited local churches decorated with tons of roses for Our Lady's celebration. So beautiful! Two years ago in 2012 on Our Lady of Guadalupe's feast day I announced I was pregnant with our Cupcake #5! The image from Juan Diego's tilma is on display in Mexico and has not deteriorated since the 1500s when the image first appeared. There are many other miraculous facts about this image. To read some of these facts, you can read the post, "Little Known Facts About Our Lady of Guadalupe". You can also read "Our Lady of Guadalupe ‘completely beyond' scientific explanation, says researcher", which is an article that explains how researchers to this day say "there is no scientific explanation for the 478 years of high quality-preservation of the Tilma or for the miracles that have occurred to ensure its preservation." 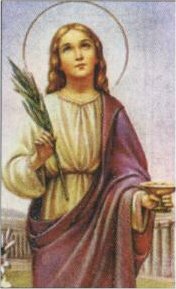 December 13 is the feast day of Saint Lucy. Lucy's name means "light", with the same root as "lucid" which means "clear, radiant, understandable." If you do not know about this young, beautiful saint you can read more about her here.We usually travel around town and look at Christmas lights to celebrate this Saint. This year we are going to a local garden for their walking Christmas light tour on the evening of December 13. 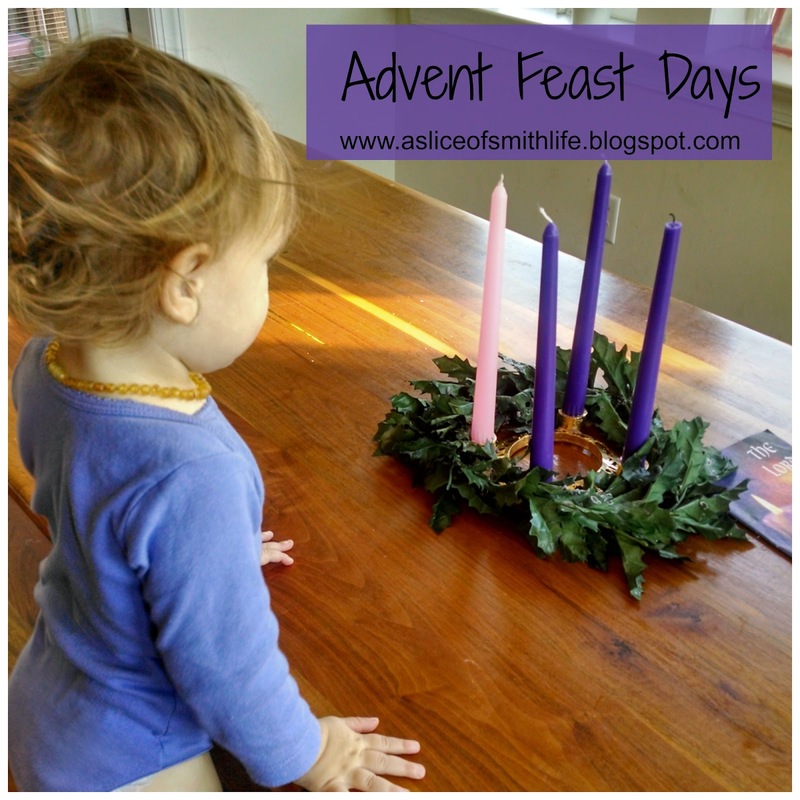 My oldest daughter especially loves this feast day because it is a Swedish tradition that the oldest daughter in the family wears a white dress with a red sash (red symbolizes martyrdom) and she wears a St. Lucy crown with candles on it. The daughter serves sweet rolls to family members. Some years I make the cinnamon rolls, while other years I forget or don't have time, but it's always a hit when the rolls are baked and eaten to celebrate Saint Lucy. 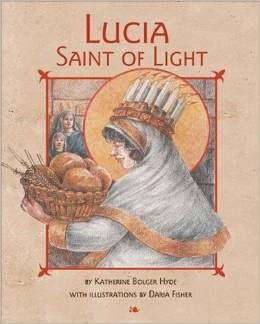 Our family just received Lucia: Saint of Light on Saint Nicholas' feast day so I plan on reading this book on her feast day. 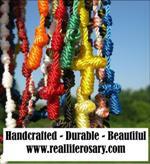 May you have a blessed week full of faith-filled and fun feast days! 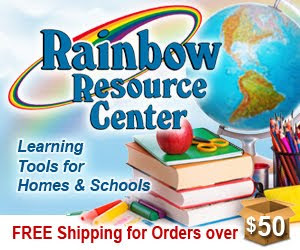 Great collection of crafts and resources for this special week packed with a feast Days, Tracy! I love the picture of your little 16 month old...so sweet! Yes Patty, so many fun and festive holy days this week! 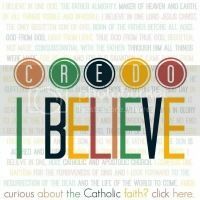 Makes me happy to be Catholic as we celebrate not just on Christmas and Easter! :) Thanks for stopping in!